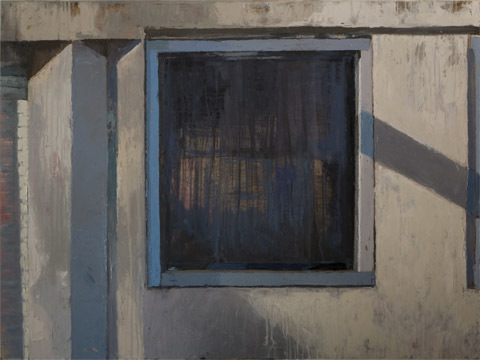 Contemporary painter Sharon Feder, a longtime resident at Ironton Studios and Gallery, is the subject of a good-looking solo there called Topologies, which represents both a continuation of her interest in urban archaeology and a change in direction. The subject matter -- rundown warehouses -- links her work to that of others in the area like Rick Dulaand Sarah McKenzie; together, they constitute a veritable school. Colorado artist Sharon Feder will open an exhibition of her most recent paintings with a show entitled Topologies at Ironton Gallery in Denver on November 20, 2012. These paintings, all completed during 2012, are an extension of the artist’s previous six year’s work. Here Feder expands her study of space and place and the interplay between them. These powerful, large scale panels are composed of multi-dimensional planes that build and break apart; fractal views into the larger world. Reflective of Feder’s own philosophy, these paintings demonstrate that the choices we make in each moment eventually determine how our visual world is structured. Humanity is archival, like the strata that compose the earth beneath us. Our structures and art, superfund sites to cathedrals, exist because of us. The things we create form layers upon the earth, reflecting humankind, interwoven with the natural world that birthed us. We make the marks we make, like the creases in one's face, witnessing and demonstrating the story of each life. We won't be here forever. We can't be. It is not tragic. The paintings in this series, “Topologies”, ask questions: what will the layers of our own existence look like in one hundred years, in one hundred thousand years? Will our leavings appear gem-like, as petrified dinosaur droppings; provide essential fuel to some distant descendants; or when excavated, simply disappear into the air? Our choice is whether to exist in fear or to see our existence as a celebration of our existence. Life is archival. The exhibition will open to the public on November 20, 2012 at Ironton Gallery, 3636 Chestnut Place, Denver, CO 80216 and the artist reception is on Friday, December 7, 6-10 pm. A closing reception will be January 4, 2013 from 6-10 p.m. Ironton Gallery is open Monday-Friday, 10am-4pm and Saturday’s from 12pm - 4pm. Arvada CO – The nationally recognized Arvada Center will open its latest art gallery exhibition, FACES, PLACES & SPACES sponsored by Exempla Lutheran Medical Center with a public reception on Thursday, June 7 from 6-9 p.m. FACES, in the main gallery, goes beyond the traditional portrait show focusing only on the face, the quintessential expression of humanity. Through painting, photography and sculpture, PLACES, in the upper gallery, will highlight the juxtaposition of the interior, intimate and exterior, urban spaces created by humans. SPACES, in the theater gallery and in collaboration with Michele Mosko will feature large encaustic work by Earl Schofield and ethereal paintings by Lanny DeVuono, two artists who tackle open spaces. "The Arvada Center is proud to be presenting a major exhibition featuring 36 of the region’s top artistic talents.” Remarked Collin Parson, Exhibition Manager, “From emerging to internationally known, these artists aim to explore the artistic dialogue that these genres have created in art and the continued evolution of their various representations. We are honored to be partnering with eight of the state’s top galleries to help secure these top-flight artists." The galleries represented are Walker Fine Art; David B. Smith Gallery; Michele Mosko Fine Art; Plus Gallery; Rule Gallery; Sandra Phillips Gallery; Shark’s Ink. and William Havu Gallery. When one thinks of place, we think of an architectural landmark, urban landscape, or somewhere as simple as home. It is we, as human beings, who often define them as a place. These places can be large or small, inside or out, but we determine their function or purpose. No matter where we go, we are always in a place, both literally and metaphorically. The artists in this exhibition express their interpretation of place through many forms of media and matter, giving credence to the sense of place. Artists represented in PLACES include Marc Berghaus; Lisa Calzavara; Alan Chimacoff; Rick Dula; Sharon Feder; Sarah McKenzie; David Menard; Chandler Romeo and Denis Roussel. EXPORING ABSTRACTION opens Sunday, June 26th with special gallery hours of 11 – 5 pm and will continue through August 21st with regular gallery hours Wednesday – Saturday, 12 to 5 pm. 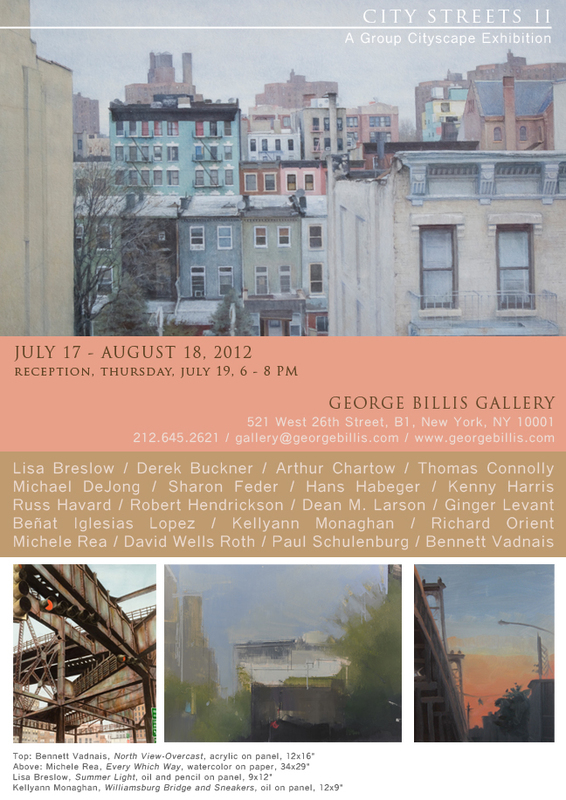 Michele Mosko Fine Art is pleased to introduce the second in a series of Salon Sunday exhibitions. Gallery Director Brenda LaBier has curated this dynamic exhibition entitled EXPLORING ABSTRACTION, featuring works on canvas, panel and paper by Andy Berg, Ken Elliot, Sharon Feder, Edward Lentsch and Michael Rubin. Salon Sunday’s are eclectic exhibitions with diverse and varied works. This month’s exhibit of abstract painting is particularly bold as the artworks selected vary greatly in technique, style and approach. In spite of the different artists selected and their unique applications, the reference to nature reveals itself as a theme in three of the painters shown. Ken Elliot and Sharon Feder depart from their often recognizable and sometimes literal style to create emotive works that are abstracted expressions of city and land. In AfterGlow a richly painted square canvas by Elliot, the turbulent sky builds to contrast with the pastoral ground below but ultimately abstracts to blocks of color. Feder’s paintings of Jet’s Trees-Blue allow us to look up to the sun filled sky and beyond so that what might be exact imagery blurs to a hazy sunlit distance. Michael Rubin utilizes mark making in a completely abstract style, but his colors and the internal order of Black Current and Fall succeed in bringing us to the river’s edge and to an autumnal day. Andy Berg and Edward Lentsch’s paintings complement one another as purely abstract with emotive works. Lentsch utilizes natural materials of wax, silica and paint to create a textured and visceral surface that is both brut and zen in effect. Andy Berg’s bold colors and naïve mark making create fresh imagery that seem to carry the viewer beyond the canvas to touch the subconscious; his and our own. Painter Sharon Feder’s work fills the main gallery at Ironton. The paintings are hung neat and orderly but they reveal nothing less than the hidden tensions of contemporary life. Oil paintings of quotidian scenes and subjects: commercial spaces, warehouse districts, gas stations. Geometric shapes suggested by old buildings and modern businesses. Muted complex browns and grays, accented by reds and sky blues. Highly personal brushstrokes remind us of the materiality of paint and subject. But these spaces are not what they seem. They stand in for human relationships, analogous to isolation, despair and the constant contradictions of appearance versus truth. Ostensibly, these are buildings with commercial promise but closed and empty. But let me add, before the reader thinks Feder’s work is negative or cynical, that her sharp vision redeems the spaces, finds the visually exciting composition, color contrast, and implied human narrative that takes our observations of the work to a higher level. This is not a cold, hard clinical view of the world, but a view filtered through the warm human sensibilities of an accomplished artist. The starkly cropped view of a scene is modulated by sensuous paint and color combinations. An example: two metal barrier poles in a parking lot, seem like a couple of characters in a play, red and worn, doing their job on a stage of gray and brown, lit from the side. Familiarity is deceiving. We have seen these places many times; we take them for granted. Feder’s images themselves are not shocking but ring true to our lives, if we are familiar with urban areas. We recognize the shine of glass, painted metal, and the expanses of concrete. It is a distinctly American and Western place. The sunlight that fills the American West strikes obliquely, unmitigated, and a hint of distant hills can sometimes be seen behind the brash metal and concrete. Shadows play a role here. They stretch across the empty spaces, reminding us of the lateness of the day, and the time we have left. What can we conclude about this series of paintings? Like most art works they are about the inner self — a portrait of the artist’s mind at a certain point in time. Ordered spaces, with exterior layers that show evidence of the passage of time and exposure, but with hints of intimacy and full of surprises. Interiors that are hidden and unknown. Paradoxes that will remain so. After looking hard at Ms. Feder’s paintings, I was offered a private glimpse by the artist, in a backroom, of her future series: a new painting that I will not describe here, but offers new, even more complex vision, and direction. ‘The Art Of Saming’, Sharon Feder. ~ by Peter Illig on November 7, 2010. 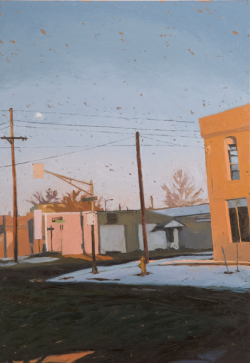 Sharon Feder’s Edge of the Plains is a contemporary look at today’s West with the ever-changing architecture of Denver. Her exhibition supports the Arvada Center’s long-standing mission to showcase and acknowledge the area’s regional contemporary artists. A Colorado native, Feder’s urban imagery speaks to the tensions—economic, social and spiritual—of our post-industrial world. In subject matter and through the rhythmic compositions of form and color, her paintings document and celebrate the choreography of our existence. The exhibition consists of approximately dozen paintings from small to large scale, oil on panel. Gallery hours: 10am – 4pm Mon. – Fri., noon – 4pm Sat. In The Art of Saming, Feder takes a careful and caring look at the epidemic of homogeneous architectural forms which have been consuming our lands. Within the superficial uniformity, the artist finds a symphony of color and geometry and movement. Feder paints at the boundary between realism and abstraction, where a reflection is as much an abstract shape as it is light against a reflective surface. This exhibition featuring the work of nine Colorado artists celebrates and interprets the Gardens’ unique architectural features. 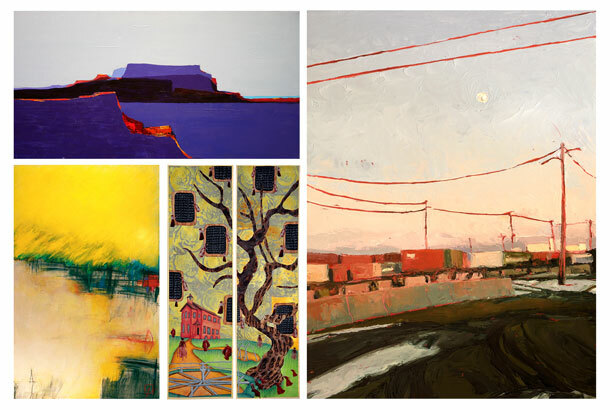 Working in a variety of media, artists in the group show include: Jamie Bolane (Boulder), Eric Dallimore (Denver), Sharon Feder (Denver), Amy Giertz (Lakewood), Dan Hartline (Erie), John Lencicki (Denver), Christopher Phelps (Centennial), Cheryl Price (Conifer), and Katharine Smith-Warrant (Denver). The exhibit provides an appropriate punctuation to the 50th anniversary of the Gardens’ York Street location, in addition to celebrating iconic structures amid new developments. Historic components explore the design of Victor Hornbein’s and Edward White, as well as the contributions of Garrett Eckbo and Saco DeBoer. A cell phone audio tour highlighting architectural details both inside and outside is available. The Denver Theatre District's Art Salon in the Hotel Teatro is a journey around the world of visual art and music guided by local artists. 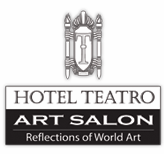 The Arts Salon offers an opportunity to experience the Hotel Teatro and the Denver art world in a whole new way. Traditional canvas, dimensional art, film and photography will be used in unique ways to compliment musical entertainment throughout the spaces of the hotel. Denver has been selected as the first metropolitan cityscape to be highlighted before we journey to New York, Buenos Aires and beyond. The Sounds and Visions of Denver will feature artist Sharon Feder with music provided by Janet Feder. The Art Salon will take place the third Wednesday of each month and will feature themed food and drink specials, complimentary regional appetizers from the kitchen of Kevin Taylor. 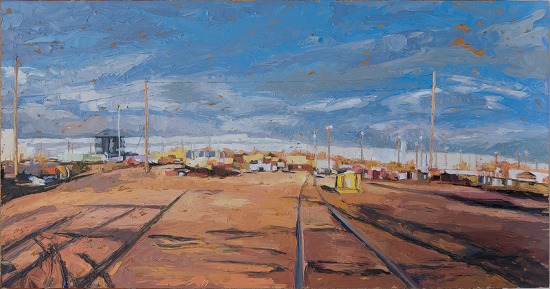 Sharon Feder's painting, Trainyard No. 7, was included in a recent exhibition at the Forney Museum in Denver, Colorado. Building No. 2, oil on panel, 24 x 36 inches, 2008. 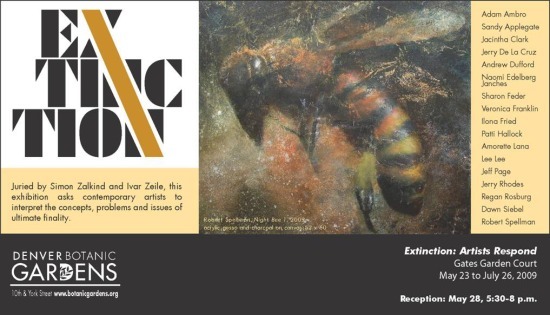 Juried by Simon Zalkind, Curator, Singer Gallery, Mizel Arts & Culture Center and Ivar Zeile, Director/Owner of Plus Gallery, this exhibition presents contemporary artist responses to the concepts and issues raised by the potential extinction of species. For more information or directions click here. Building No. 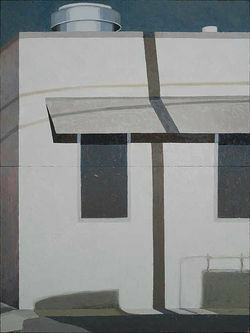 8, oil on panel, 36 x 24 inches, 2008. Railyard No. 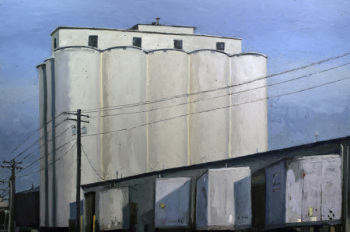 3, oil on panel, 18 x 36 inches, 2009. 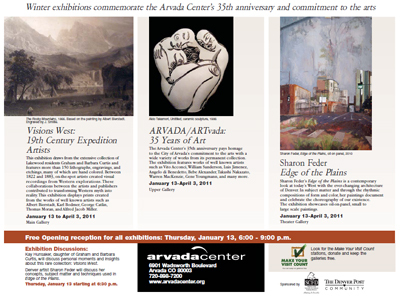 The City of Aurora’s Art in Public Places program has selected eight fine art exhibits for the 2009 municipal gallery schedule. Seven local artists and one group exhibit will grace the walls of city buildings through Dec. 15, including Jeff Ball, John Curtis, Sharon Feder, Chris Lombardi, Theresa Lugo, Jeff Richards, Cynthia Thomas and Downtown Aurora Visual Arts. All were selected to provide a compilation of artwork for exhibition in one of four municipal galleries at various times. Aurora’s fine art exhibit galleries are free and open to the public, contributing to Aurora’s cultural vibrancy while supporting local and regional artistic activity.